Henry’s Metal Polishing finished the surface of a two-story stainless steel and glass staircase that was installed in a commercial building on El Camino Drive in Beverly Hills. Polishers resurfaced the stainless steel to a #4 architectural brushed finish, giving the material depth, grain, and character. Once it was assembled, workers hand-sanded and finished the structure to remove any blemishes left from welding and assembly. Photo courtesy of Henry’s Metal Polishing. Henry’s Metal Polishing Inc. (www.henrysmetalpolishing.com) is a metal finisher based in Los Angeles for the last 67 years, with a specialty that attracts business from the big three: artists, architects, and industries. Henry’s was founded in 1951, and, three years later, construction on Disneyland started down the road in Anaheim. Company legend says Henry’s finished the original handrails. More recently, the metal finishing company finished stainless steel door handles for Apple Stores across Europe. At its founding, the company finished parts for plumbing and other commercial clients, but most of that work moved to Mexico and China, said company owner Enrique Nikutowski in an interview with Design-2-Part. Henry’s Metal Polishing isn’t finishing the number of faucets, knobs, and shower heads that it started out making. Today, the company works in numerous industries by fabricating and finishing legs for tables, chairs, and couches; custom metal table bases; residential hardware; and indoor and outdoor architectural features, including door jambs, stairway components, and door headers. The company fabricates, welds, polishes, and grinds stainless steel, aluminum copper, and other metals. 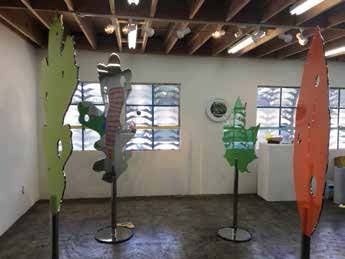 Its customers include one-of-a-kind art projects, such as sculptures and signs. The company also works on pool projects and high-end lighting fixtures. The finished and installed Ascension statue by Ryan T. Schmidt was polished and finished at Henry’s Metal Polishing for the Art of Palms exhibit in honor of the Beverly Hills Centennial celebration in 2015. Workers at Henry’s Metal Polishing polished the 11-gauge 304 stainless steel structure that measured 12 feet by five feet, to a #8 mirror finish. Photo courtesy of Henry’s Metal Polishing. Among the pieces Henry’s polished was Ascension, an 11-gauge 304 stainless steel sculpture that was displayed in 2015 for the Beverly Hills Centennial during its year-long Arts of Palm exhibit. Ryan T. Schmidt’s Ascension appeared at the Beverly Canon Gardens. Henry’s Metal Finishing polished the 12-foot tall by 5-foot wide piece to a #8 mirror finish, a stainless steel looking glass designed to reflect both earth and sky. The entire piece, all 12 feet by 5 feet of it, must be blemish-free—no marks, no scratches, no lines. Nikutowski explained that workers at Henry’s polished the Ascension sculpture with a full range of sandpapers, starting with 60 grit and progressively moving to finer and finer grits until Schmidt was satisfied with the mirror finish revealed by 1500-grit sandpaper, followed by a sisal and color buff. While polishing and grinding the metal, Henry’s workers removed the weld marks and any heat discoloration in the metal, making the steel sculpture seem like one piece of metal. Corporate customers are different from artists. “They tell you one time what they want, they tell you the standard, and that’s the end of the story. What we hear is, ‘This is what I want it to look like. Can you match that sample?’” Nikutowski said. His job when working with a corporate customer is to talk to the OEM, learn exactly what they want, and then talk to his employees at Henry’s to make sure they’ll meet the customer’s expectations. Good communication is essential. Nikutowski said each customer requires a personal touch and a long conversation. “Henry’s offers smooth, blemish-free satin and mirror finishing on many metals, including aluminum, stainless steel, brass, copper, and bronze,” Nikutowski said. The company’s equipment includes polishers, belt sanders, and buffers working with grits from 60 grit up to 600 grit. Parts can be up to 20 feet long by three feet wide. Henry’s services include pre-polishing, finishing of welds, repairs to incomplete welds, and repairs to pits and voids. The company offers touch-up welds and light machining. Its value-added work includes engineering, production, design, fabrication, assembly, and final packaging. About 70 to 75 percent of the finishes are done on stainless steel. Another 10 to 15 percent is aluminum. Brass is third. Steel is fourth. The company’s value-added services are designed to streamline the customer’s supply chain. They include drilling, tapping, forming, welding, light assembly, finishing, packaging, Just-in-Time warehousing, cut-to-length blanks, and an ISO compliant quality management system. Henry’s can produce high- and low-quantity orders, as well as finishing prototypes. In one recent architectural job, Henry’s Metal Polishing finished the surface of a two-story stainless steel and glass staircase to be installed in a commercial building on El Camino Drive in Beverly Hills. Workers picked up the stainless steel components at the fabricating plant in Long Beach, brought them to Henry’s Metal Polishing in Los Angeles, and resurfaced the stainless steel to a #4 architectural brushed finish. After finishing about 95 percent of the staircase polishing, the stainless steel components were returned to Long Beach for final assembly into one structure. The piece, now welded together into a one-piece two-story stainless steel staircase, was finished by Henry’s polishers, who sanded the welds and smoothed out the transitions using fiber disks from 36 to 120 to remove the excess material and prepare the surface for final hand graining. It was driven to Beverly Hills, where a crane lifted it into the building. 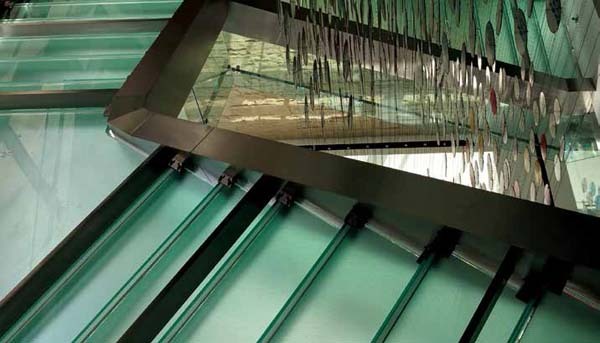 Workers set it in place, leveled it, and attached the stainless steel connectors to hold the glass stairs. Henry’s Metal Polishing finished a series of six stainless steel leaves cut from ⅜-inch sheets into the shape of leaves, and then polished to a #8 mirror finish. The artist is Hiromi Takizawa of California State University Fullerton. 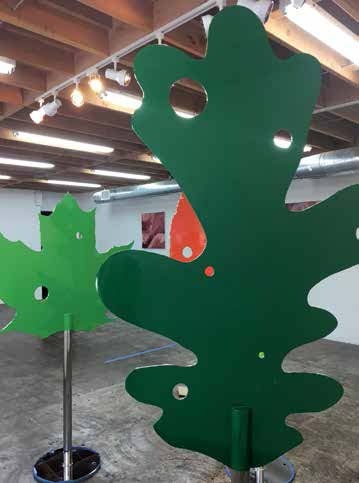 The leaves will be installed in downtown Santa Ana. The work involved pre-polishing the metal, which was five to six feet tall and about 30 inches wide, weighing more than 100 pounds each. The leaves were sanded with a progression of belt sandpaper in grits starting with 40, and then rising step by step, to 60, then 80, 120, 150, 180, 220, 240, 320, and, finally, 600. Once the pre-polishing is done, workers remove any lines by buffing the metal with a sisal and color buff.